I am charmed knowing that today, at least some parts of the world, your Corporate Wife can be your gay husband, and that it helps to excel your career. The recent tsunami tragedy has overwhelmed millions. So many people have lost everything. I'm not certain how to help aside from sending money and good thoughts. What would I want done for me? Fresh water would be a good start I suppose. Donations to the following organizations may help. A little over a year ago I started this blog and while I have thought of chucking it several times since, I am glad I've kept it up. Thanks for reading it and giving me encouragment. Without it, I think I wouldn't have written anything at all this year. You know it must be winter when nearly all referrers to my site come through a search for French Toast Casserole. A few years ago in attempt to become a better writer I picked up a book titled Bird by Bird by Anne Lamott. I didn’t like the book at all and as a result am still not much of a writer. I did pick up one tidbit of inspiration from the book, the paragraph which discusses the title of the book. One day the author’s brother, when he was a youth had a science project whereby he had to document some 50 bird sighting over the summer. Now summer is all about fun and even if you consider documenting birds fun, most likely you too would wait until the vacations penultimate date to do the assignment. Panicked, he asked his father for help. The father suggested the son approach the project in little bits at a time, or bird by bird. Entering what is supposed to be my new studio space last week sent me in a bit of a panic. Well actually I was more aggravated than panicked. My girlfriend, Cisca the Encouraging, suggested taking possession of it bit by bit. And today, that what I started to do. In truth, I nearly vomited once, uncovering the source of the stench (and I knew even cats could smell that bad), and the place is not nearly ready for unpacking my things and sewing. But as I clean, my spirits actually lift in hopes that every newly cleaned centimeter will (eventually) be mine. This one is an absolute winner. We liked it when we first cut into it. We liked it the next day, we then froze half b/c we were going away and when we came back and unfroze it, we still liked it so much. 1 Combine the four, cocoa, baking powder, soda, salt, and cinnamon; set aside. 2 With a mixer, beat together the butter and the sugar until they are smoothly blended. Add the eggs to the butter and sugar mixture one at a time, beating well after each addition. With a spoon, stir in the vanilla, orange peel, and zucchini. 3 Alternately stir the dry ingredients and the milk into the zucchini mixture, including the nuts with the last addition. 4 Pour the batter into a greased and flour-dusted 10-inch tube pan or bundt pan. Bake in the oven for about 50 minutes (test at 45 minutes!) or until a wooden pick inserted in the center comes out clean. Cool in pan 15 minutes; turn out on wire rack to cool thoroughly. 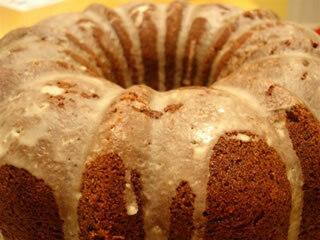 5 Drizzle glaze over cake. I want to know, why is the pizza in New York City so much better than anywhere else in the world?